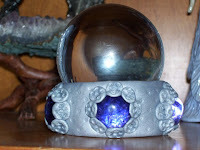 Silver polymer clay and more faux gemstones went into making this stand for my glass sphere. The original stand was a small wood ring. I built this replacement stand around a small glass candleholder wrapped in waxed paper which I removed prior to baking. I think it goes well with the little fantasy figurine collection that you can kind of see in the background.